Only missing the kitchen sink. 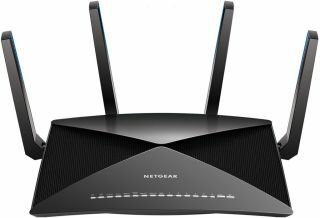 Netgear has a new router available to order, the Nighthawk X10 AD7200 (R9000), and not only is it supposedly the fastest model in the world, it's packed with so many features that Netgear is having a hard time figuring out which type of buyer to focus on. Is it for VR gamers or people who stream 4K content? Mobile users? Future-proofers? Try all of the above. Let's start with the basics. As the model number suggests, the Nighthawk X10 includes both 802.11ac and 802.11ad wireless. The latter operates over the unlicensed 60GHz frequency band and is terrible at penetrating walls and other obstructions, which limits its range. But in open, short-range environments with a direct sight, it can hit much faster speeds—up to 4.6Gbps (4,600Mbps), in this case. Including 802.11ad wireless is a future-proofing move on Netgear's part, as there aren't many client devices that support the faster protocol. That will change in time, particularly with the push for 4K video streaming and VR gaming, both of which are market segments that Netgear is aiming towards with the Nighthawk X10. The other bands (2.4GHz and 5GHz) benefit from the Nighthawk X10's external active antennas for range and speed (it has four receiving and four transmitting antennas, along with four spatial streams). While 4.6Gbps is earmarked for the the 60GHz band, the remaining advertised throughput provides 1.7Gbps (1,733Mbps) for the 5GHz band and 800Mbps for the 2.4GHz band. Add those together and you arrive at 7,133Mbps, which Netear rounds up to 7,200 (AD7200). You can't combine those connections into a single one, though out of the six gigabit LAN ports on the back, you can utilize two of them in aggregation mode for faster file transfers up to 2Gbps. There's also a 10Gbps fiber port to boost backups and media streaming to and from ReadyNAS and other NAS boxes, and four USB 3.0 ports. The Nighthawk X10 further separates itself from the pack by being the first to bring native Plex server support. Plex is built into the router, which you can use to stream media stored on attached USB devices. It can also handle 4K transcoding without a PC—there's a 1.7GHz quad-core processor inside. To get users started, Netgear includes a three-month Plex Pass subscription. Other features include 512MB of NAND flash memory, 1GB of DDR3 RAM, MU-MIMO support, beamingforming on the 2.4GHz and 5GHz bands, and various other technologies that are now fairly standard on wireless routers. The Nighthawk X10 is available now for a wallet-busting $500—kitchen sink not included.